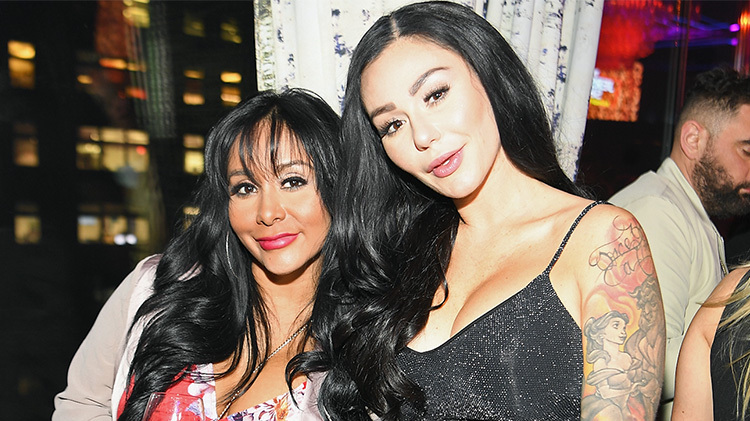 Just because Jersey Shore stars Nicole "Snooki" Polizzi and Jenni "JWoww" Farley are moms now, doesn't mean they can't stay best friends. The two reality stars seem like they have actually gotten closer since having children because their daughters are pals, too. From their days at the shore to wild Miami nights to publicly acknowledging their bond, Snooki and JWoww really are best friends forever. That said, as recent episodes of Jersey Shore Family Vacation have shown these two can seriously go at it — especially when it comes to arguing over Snooki's drunk antics. Ahem, losing her wedding ring. So much so, that tons of people on the Internet are wondering if Snooki and JWoww are even still BFFs?! Some people are even going as far as to troll the ladies about it! One person on Twitter wrote, "You should have just punched @snooki dumb dramatic a–!" Well, to that, the ladies have a little message. Snooki shared the following video to Instagram on April 18 and we're pretty sure it clears the air once and for all. Of course, video aside, there are plenty of other instances that prove Jenni and Snooki are the two best gal pals anybody could hope for. Keep scrolling to check out all of the evidence that proves their friendship is solid! JWoww punched Mike "The Situation" Sorrentino for calling Snooki fat. While the crew was filming Jersey Shore Season 1 in Atlantic City, Snooki asked a waiter for a bread roll during dinner. Mike fired back and said, "Don't worry, you've got a couple," referring to Snooki's weight. Snooki left the table visibly upset and JWoww later backhanded him in the face — because that's what friends are for, right? JWoww took care of Snooki in Miami on Jersey Shore Family Vacation. In the premiere episode of Jersey Shore Family Vacation, the gang went back to their partying ways at a club in Miami. When Snooks had too much to drink and basically tripped over her own two feet, JWoww rallied everyone together to go back to the house — and she even put Snooki to bed. Cabs are here! Snooki supported JWoww's relationship with Roger Matthews since day one. Snooks gave her seal of approval at the very beginning of JWoww and her husband Roger's relationship. During an episode of the show she said, "I think Jenni and Roger are the perfect example of a guidette and a juicehead dating." The rest is history, as the pair got married in 2015 and have two kids together — Meilani, 3, and Greyson, 1. They were in each other's weddings. Snooki was one of 20 bridesmaids in JWoww's over-the-top wedding, and Snooki's special day was a spectacle as well. She decided to have JWoww stand by her side as well as her other Jersey Shore roommates, Sammi "Sweetheart" Giancola and Deena Cortese. They publicly acknowledge that they are best friends. Snooki shared a photo of her and Jenni for International Women's Day and wrote, "Happy #internationalwomensday I'd like to shout out my best friend who is the strongest woman I know. The best mother & hardest worker all in one! You take no sh-t and you inspire me everyday. MAWMA." JWoww's daughter, Meilani, and Snooki's daughter, Giovanna, are also besties! They regularly have playdates and the Jersey Shore stars are sure to share it all on social media. JWoww recently posted a video of their daughters hugging and dancing at the same time, which will make any fan's heart melt. They cry for their kids together. While down in Miami for Jersey Shore Family Vacation, the crew headed to an outdoor bar on South Beach to have some fun in the sun. Unfortunately, the waterworks started as Snooki's son's favorite song started to play. Her tears led JWoww to cry over missing her own kids — because when one friend cries, the other cries with her!